Northern Ireland MEP Diane Dodds will host a seminar in Lagan Valley (details in notes) on Saturday (2 February) to highlight funds available to our faith sector from the EU as well as other funding streams. Diane Doods, DUP MEP, is hosting an EU fundinhg semnar in Lisburn and is encouraging religous groups across te North to take up the funding opportunities available. 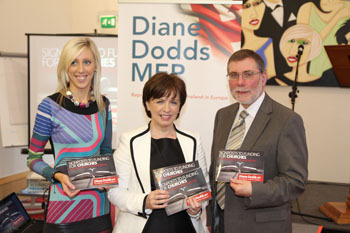 Mrs Dodds will also detail some of the work currently underway in the European Parliament regarding freedom of religion. Commenting Diane Dodds said: “Churches and faith-based organisations continue to play an enormously positive role within Northern Ireland. However, in a society that has become increasingly secular in outlook, many of these groups are of the belief that nothing is available for them. Others believe that their faith prevents them from applying from certain sources of support, most notably Lottery funding. “My new publication highlights that such thinking is flawed. It presents potential applicants with various EU funds amongst over 30 sources of funding. These streams offer assistance with projects for buildings, refurbishments, equipment, core costs, youth work and Christian education, whilst prioritising the most vulnerable groups in our society. “These funding-streams from the EU also recognises the international dimension of the work carried by churches and faith-based organisations. Many organisations are involved in missions, health and welfare, education, training and relief all over Europe. “I will also be updating attendees on the role the European Parliament can play in defending freedom of religious expression, addressing the persecution of Christians across the world and also the need to be a strong voice for the unborn child in the European institutions.